Space Images | Hurricane Alex, located about 80 miles south-southeast of Charleston, South Carolina, as observed by NASA's Spaceborne Atmospheric Infrared Sounder (AIRS). 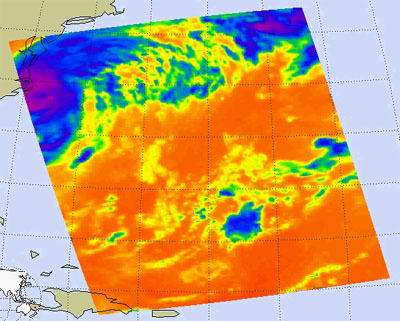 Hurricane Alex, located about 80 miles south-southeast of Charleston, South Carolina, as observed by NASA's Spaceborne Atmospheric Infrared Sounder (AIRS). 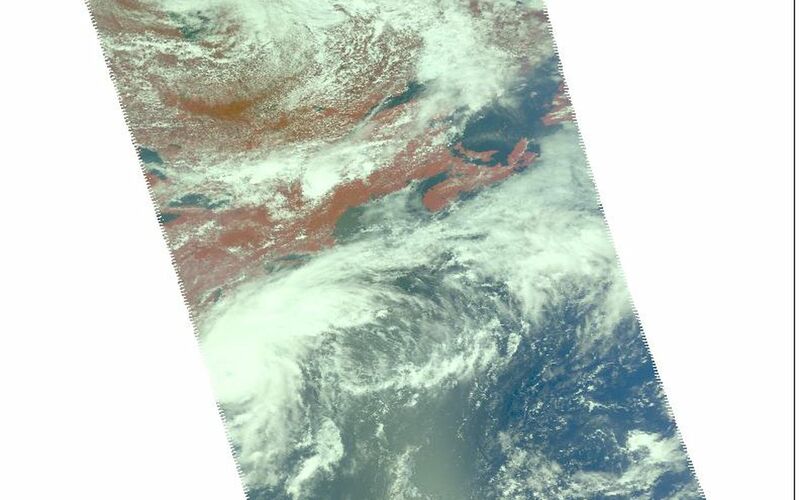 These images of hurricane Alex were captured on August 3, 2004 at 1:30pm EDT. Located in the Atlantic Ocean located about 80 miles south-southeast of Charleston, South Carolina, Alex is now a category 2 hurricane with maximum sustained winds were near 100 mph (161 kph). Alex's center was about 65 miles (104 kilometers) northeast of Cape Hatteras and moving away from the U.S. coast. The major contribution to radiation (infrared light) that AIRS infrared channels sense comes from different levels in the atmosphere, depending upon the channel wavelength. To create the movies, a set of AIRS infrared channels were selected which probe the atmosphere at progressively deeper levels. 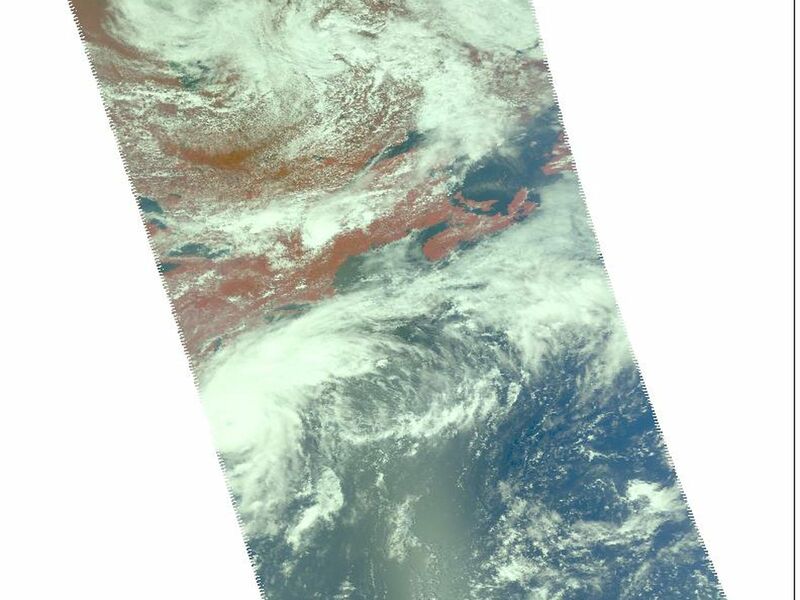 If there were no clouds, the color in each frame would be nearly uniform until the Earth's surface is encountered. The tropospheric air temperature warms at a rate of 6 K (about 11 F) for each kilometer of descent toward the surface. Thus the colors would gradually change from cold to warm as the movie progresses. Clouds block the infrared radiation. Thus wherever there are clouds we can penetrate no deeper in infrared. The color remains fixed as the movie progresses, for that area of the image is "stuck" to the cloud top temperature. The coldest temperatures around 220 K (about -65 F) come from altitudes of about 10 miles. 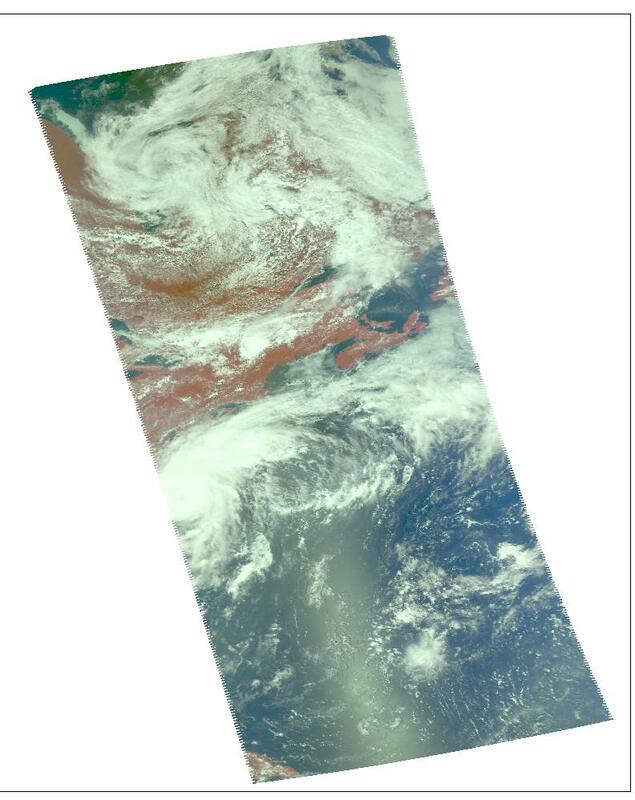 We therefore see in a 'surface channel' at the end of the movie, signals from clouds as cold as 220 K and from Earth's surface at 310 K (about 100 F). The very coldest clouds are seen in deep convection thunderstorms over land. 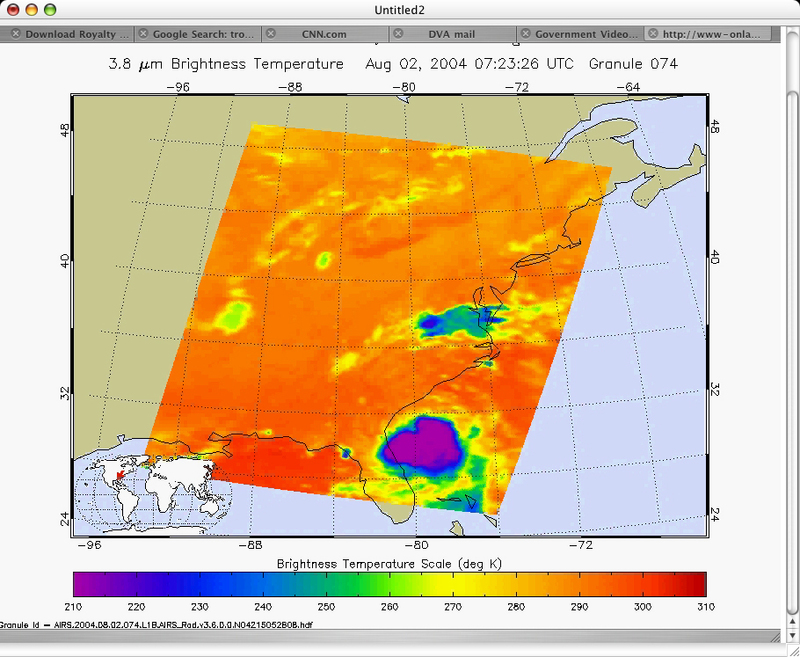 Frame from August 2 movie, slicing down the atmosphere with the AIRS infrared sensor. Alex a tropical storm, sustained winds at 60 mph. The storm is 115 miles southeast of Charleston, South Carolina, traveling northeast at 6 mph. 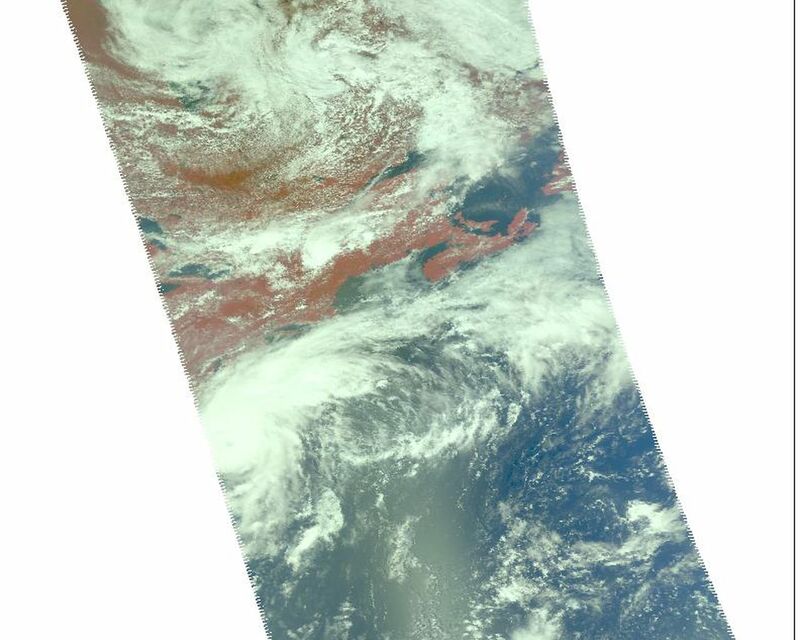 Daylight snapshot from AIRS visible/near-infrared. At the time AIRS made this observation, Alex was still a tropical depression and just getting organized. Slice down the atmosphere with the AIRS infrared sensor. Alex becomes the first hurricane of the 2004 North Atlantic season with sustained winds at 75 mph. Alex is located about 120 miles southeast of Charleston, South Carolina. Alex has now begun to move to the northeast and a general northeastward track is expected the next couple of days with a gradual acceleration in forward speed as it begins to interact with stronger upper level winds. Alex now has sustained winds of 35 knots. Alex is tropical depression and beginning to get organized.